Lucy helped to found Bangor Land Trust in 2001, so that landowners and others who love the land could work together to conserve Bangor’s most valuable natural areas. Lucy is a clinical psychologist in private practice and enjoys sailing, bird watching, walking in the woods, learning about the natural world, and participation in Bangor's civic life. Bill is a retired software engineer who lives in Orono with his wife. He has been involved in efforts to preserve those things that he feels make Bangor unique and desirable: its architecture, downtown, city neighborhoods, and natural environment. He wants to continue this through his involvement with Bangor Land Trust. Bill joined the BLT Board of Directors in September 2006. ​Greg is a graduate of Bangor High School and UMaine, and is a Staff Accountant and Marketing Manager at Edwards, Faust, and Smith. His free time is spent mostly in the kitchen, on a bike, in the garden, lost in the woods, or imagining his life as a 19th century lumber baron in the Queen City. Jim was born and raised in Waterville, Maine. He holds a B.A. from Williams College, 1963 and a Ph.D. from Harvard University, 1968. Jim was a neuroscientist at Boston University School of Medicine from 1967-1983 and was a certified public accountant here in Bangor until 2011. He is interested in land conservation, wilderness hiking, birdwatching, botanizing, and the scientific study of lichens. Jim is a Founding Board Member. ​For Grace Bartlett the woods, fields, frog ponds, and streams have been in her cells since growing up on a small farm in rural New Hampshire. Grace now lives in Bangor, is the Pastor at First Congregational Church, UCC, Brewer, and is a Maine Master Naturalist. In her spare time Grace is apt to be found absorbed in the wonder of creation as she wanders a trail with a hand lens, a camera, and notebook in hand. Michele spent her childhood in southern Connecticut, a stone’s throw away from NYC. There she explored the gardens, woods, beaches and islands that surround Long Island Sound. Throughout her studies at Greenwich High School, Brown University, and the University of Maine, Michele’s interest lay in the natural world, the ecology of place, and the relationships found there. After moving to Maine in 1987, Michele’s studies in Forest Ecology allowed her to experience Maine’s woods and waters. She since has wondered the state with camera and bicycle, to record the natural beauty that is Maine. She also has worked with the Maine Science Festival, and is a member of Walk’n’Roll, a group that advocates for safe walking and cycling in Bangor. Katelin Craven grew up in Austin, Texas, spending lots of time outside hiking, biking, rock climbing, and exploring. She then studied environmental science at The Colorado College in Colorado Springs and worked a few years in wildlife positions, including the endangered Black-footed Ferret recovery project, before pursuing a graduate degree in Wildlife Biology at the University of Northern Colorado. Bats were her primary focus and she hopes to continue to work with them here in Maine where they face formidable challenges like White-nose Syndrome and habitat loss. 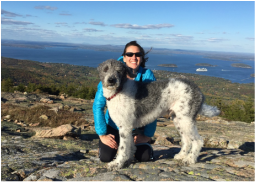 Katelin recently moved with her husband, Tim, and labradoodle, Denali, to Bangor where she has enjoyed getting involved with the community as well as exploring all that Maine has to offer. She loves to hike, bike, and ski and hopes to become a more skilled kayaker now that she is near so much water worthy of exploration. Chris joined the BLT Board of Directors in 2009. He is co-owner of a software company in Bangor, where he lives with his wife and daughter. He holds a B.S. in Mathematics from Cal Poly and an M.S. in Applied Mathematics from Carnegie Mellon. Chris' professional focus is on decision analysis and valuation, where he has done various management consulting and software projects. Chris and his family live in the Bangor area because it has so many of the things important to them: outdoor recreation, architecture, good schools, interesting weather, and the community of a real town. Chris enjoys hiking, snowshoeing, biking, unicycling and canoe racing. Robert is an avid naturalist who believes strongly in conserving the outdoor world for its ecological and intrinsic value, as well as for its critical role in personal and community health. His educational background is in environmental science and wildlife management, but he never strays far from his first passion, birds. In the past he has worked as a biologist for the USGS’ Bird Banding Lab at the Patuxent Wildlife Research Center and continues to coordinate and lead many citizen science initiatives. He lives with his wife and daughter in Bangor, where he enjoys exploring the Maine outdoors, watching the seasons change, and documenting it all as much as possible. Paul Pasquine joined the BLT Board in 2007. He is Senior Vice President at People's United Bank where he oversees the Investment and Trust Services Division. Paul holds a B.A. in Economics from Merrimack College. Born and raised in Millinocket, he enjoyed the area's natural assets, hiking and fishing in the Katahdin region. Bangor has been home to Paul, his wife Karyn and their children for nearly thirty years. They enjoy hiking, cross country skiing and fly fishing in the area as well as spending free time at their camp on Ambajejus Lake. Dave is a retired Forester and Saw Mill Manager. He holds B.S. and M.S. degrees in Forestry from the University of Maine. He is a lifelong hunter and fisherman, and is a member of Ducks Unlimited, National Rifle Association, Maine Audubon, Orono Land Trust, Bangor Land Trust, and the Tennessee Squire Association. He is active in town affairs as the Chair of the Orono Tree Board, Orono Trail Committee and a member of the Orono Planning Board. In his retirement he has worked in various capacities to improve the environment through proper management of our natural resources. He lives in Orono with his "boss" of almost 50 years, Patricia, who helps him in most of his endeavors.